The native music, songs, dances and group festivities expressed through the gypsy temperament capitalized on subtle modifications where the characteristics of the Andalusian melodies already steeped in their oriental tradition differen­tiated themselves further apart from the musical tendencies of the rest of Europe. Whereas there, music tended to what became conventional major and minor scales standardized into fixed arrangements of tones and half tones, in Andalusia the music of its songs conserved the primitive fluidity of the scale for which a better approximation would be the enharmonic modes which admit of quarter tones and in the old Greek scales had three notes instead of two in a full tone. This is the reason for which melodies in the diatonic scales in which all compositions in the Italian and Classic schools are written and performed sound too discrete, that is full of discontinuities, for the oriental not fully condi­tioned to the Western tradition and also the reason for which much of the Oriental music, to an ear trained conventionally in the West, sounds sometimes offensively dissonant, which goes to prove that the exotic is only a relative point of view. The elusiveness of the fluid melodies (which incidentally appear only in Flamenco songs, as the Spanish guitar has its standard frets and at most yield the conventional chromatic scale) and the intricate rhythms of Flamenco music are the bases for the statement that Flamenco music cannot be written. Some of the best approximations have at times resorted to changes of scales back and forth and make use of different timings in the same composition. As an example the Peteneras make use of the alternations of 6/8 and 3/4 time. Guajiras are also written in the same timing. 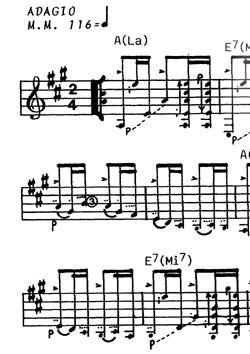 However, some attempts at writing the more complicated rhythms are compromises that crowd their complexity into simplified conventions. Thus the Seguiriyas have been written in a variety of timings that have been only approximations. I was present at a session in which an American orchestra leader who played guitar and was an expert at writing musical scores tried to discover the secret of the Seguiriyas rhythm from a Spanish Flamenco guitarist from Madrid. After several trials for a total of one hour and a half he gave up saying, "Why do you have to make it so hard?" "That is Seguiriyas" was the answer. "But you cannot write that!" "Do not blame the Seguiriyas" was the final suggestion. 2/4, 3/8, 3/8, 1/4, graphically represented in the guitar pentagram. Seguiriya is a word which has acquired the right for its own existance in its misspelling to suit the pronunciation by gypsies and the populace and does not even appear in the Dictionary of the Royal Spanish Academy (where it should be by now if we believe that the language is organic and in its growth breaks crystallizations). Whereas the Seguidillas in its general definition is written in 3/4 or 3/8, attempts at fitting its evolution, as the Seguiriya Flamenca, also known as Seguiriya gitana, into that timing, might satisfy even an erudite classicist but not the Flamenco connoisseur, for even though this queen in a straight jacket might retain charm enough to fool some people into thinking that this is the real Seguiriya, our connoisseur will recognize the unwarranted license taken with the main frame of the Seguiriya which is its rhythm of 12 beats distributed as 2/4, 3/8, 3/8, 1/4. Not only the Seguiriya but the whole range of Flamenco music has the free­dom in which the artist can soar to the pinacles of his own talent and style, but even though this leaves room for spontaneous creativity and brilliant improvisa­tion, there are skeletal frames of rhythmic patterns and significance that nobody, no matter how holy, can violate. In the words of Señor Córdoba: "Since Flamenco is folk music, the musician not only has freedom of interpretation, but is also unrestricted by written music. There are, however, many guitarists who go to extremes and take advantage of this freedom by ignoring the basic rhythmic patterns and significance of the songs." There have been many attempts at classifying Flamenco music, songs, and dances, but rather than elaborate on the countless whimsical classifications and the arbitrariness of the fallacies to justify themselves, we will make use only of the expressive quality and the rhythmic pattern to show two possible classifi­cations, adhered to by Senor Cordoba, that will give the student an overall view of the field. The classification by the expressive quality segregates Flamenco into three basic categories. The Cante Jondo or Cante Grande, Cante Intermedio and Cante Liviano or Cante Chico. I prefer not to use the words grande or chico which are prone to be used to indicate only the preferences of the classifiers. I also prefer the label Cante Jondo to Cante Hondo because, even though the former is a hangover pronunciation from the aspiration of the h in its evolution from the old Castillian language, aspiration which is approached phonetically by j in Spanish (h is never aspired or pronounced in modern Castillian), it has become limited in meaning to the expression of deep and profound feeling of a group of songs in the overall field of Flamenco music, whereas Cante Hondo may be reserved for deep in a more generic meaning inclusive of songs not necessarily Flamenco. In Cante Jondo the theme is sad and of deep emotion. In Cante Liviano the general theme is happy and joyful and Cante Intermedio is between sad and happy and sometimes one or the other. The moods in this classification are well defined although there are over­lappings at the boundaries where this distinction becomes ambiguous. This lack of rigor becomes more noticeable in the direction of the Liviano towards the Intermedio and from this towards the Jondo rather than the other way around. There is also a group of songs which even though they belong to the Jondo classification they deserve a special mention because they are sung without guitar accompaniment. They are the Debla, the Toná, the Martinete and the Saeta. Classification by the rhythmic pattern refers to the timing and is obtained by considering first the rhythmic "units" (such as 3, 8, or 12 beats). Then come the metrical combinations (such as 4 and 8). Then there is in this classification of music which, even though it is measured in 3/4 time, it is played and sung in free rhythm which allows for creativity and personal style by the guitarist and/or the singer to express his feeling without being required to observe the rhythmic pattern but keeping within signs of the characteristic style. Here is where improvisations by the uninitiated fall flat and betray the intruder. To this group belong the Malagueñas, Tarantas, Granadinas, Cartageneras and Rondena. It is the control of the style in the midst of the free rhythm which is one of the aspects of Flamenco which cannot be written and which draws out the explossive olés from the sensitive Spanish audiences. Grouping all the shades of Flamenco music under the above titles and even giving a song its accepted name is like painting with a big brush a picture in which the details are lost, thus it does not consider the variations of a given song or dance, not only from province to province, still within Andalusia, but even from town to town or the different styles created by different singers, in which each is stylized into a frame all its own. Indeed, the comparison of Spain to a Beehive of Songs, may be carried still further, and just as we have orange, clover and other honeys, the same song from different regions as sung by the inspired interpretation of different singers and sometimes sung about different subjects, have different individual characteristics worthy of a name of its own. Thus we have Seguiriyas Carceleras, Seguiriyas Playeras, Seguiriyas Corridas al Cambio, all Seguiriyas gitanas, Seguidillas Manchegas, Seguidilla Chamberga, and Seguidillas Boleras; we also have Fandango de Huelva, Fandanguillo Feriao, Saetas por Martinetes and Saetas por Seguiriyas.